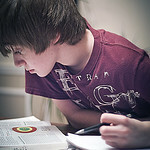 MathRider » Blog » What Is The Best Way To Learn According To Psychologists? What Is The Best Way To Learn According To Psychologists? The answer to that question might surprise you the same way it surprised me. According to a new study conducted by a team of psychologists, the best way to learn is by studying over a scheduled period of time, not highlighting, re-reading, summarization or any of the methods that most students use. The study, conducted by a team led by Kent State University professor of psychology Dr. John Dunlosky and published in the January 2013 issue of Psychological Science in the Public Interest, reviewed ten different learning techniques, all of which are widely-used by students to this day. Of the ten techniques reviewed, distributed practice, which involves sticking to a schedule that spreads out study activities over time, and practice testing, which we do with the use of flash cards or taking practice tests of material to be learned, were found out to be the best way to learn. The review used four criteria, namely, learning conditions, student characteristics, materials and criterion tasks as basis for determining which ones are highly effective learning strategies. What surprised me about this study is that the methods I employed as a student—re-reading, highlighting and underlining—got the lowest utility rating, which means I was using ineffective studying techniques after all this time. If that’s the case, does it mean I could have performed better in school had I chosen to do practice testing and distributed practice instead? It’s impossible to tell now, but I still have the chance to see if these are indeed effective learning strategies. After all, I still need to learn stuff for work, which means I will get to see for myself if practice testing and distributed practice actually do get better results. It also wouldn’t hurt to teach our children these highly effective learning strategies. Click here to read the study in full. This entry was posted on Wednesday, September 18th, 2013 at 11:18 am	and is filed under Commentary, CS. You can follow any responses to this entry through the RSS 2.0 feed. You can skip to the end and leave a response. Pinging is currently not allowed.